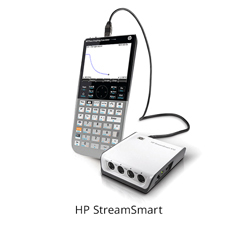 In connection with the interface "HP Smart Stream" as well as various sensors enables the device to collect and analyze measurement data with the Data Streamer App. For the recording of measurments are over 50 Fourier sensors in the fields of physics, chemistry and biology available. With this, it is possible to mesure distances, light intensity, temperature, volume, gas pressure, weight, power, pH values, measure magnetic fields and many more. The Fourier sensors are connected to the HP Smart Stream, which is connected by USB cable to the HP Prime. The collected data are transmitted in real time to the HP Prime and stored there. The data can be, for example with the help of Statistical Apps analyzed numerically and graphically. This makes the combination of the HP Prime and the HP StreamSmart together with Fourier-sensors a mobile mini-lab that evokes the spirit of research and a cross-disciplinary and ideological education possibility.